Poppy is Diez & Sigg Properties’ beloved mascot and fur baby to Craig Diez and his family. 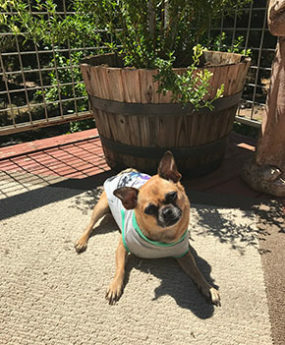 This chihuahua pug mix found her “furever” home in 2011 after Craig and his family adopted her. And boy did she make herself at home immediately! Poppy brings boundless love, energy and happiness to Diez & Sigg Properties (and a little sass) and is an invaluable member. Poppy can be spotted around town during her morning strolls with Craig and his daughter AnnMarie near Ancil Hoffman Park and The American River. She also enjoys venturing over to the office with Craig and AnnMarie when she’s not resting under the covers at home or chasing squirrels in the Diez family backyard. During her downtime, Poppy enjoys afternoon naps in the sunlight, drives around town, and munching on homemade treats – yes she’s spoiled!